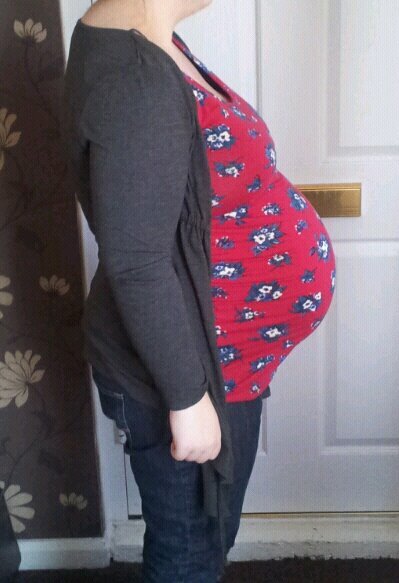 Well, I obviously got to 38 weeks as I’m here with my weekly update! I’ve had more head butting incidents from him since my last update, though not as strong, just little ones the last few times. I can definitely feel him making himself comfy down there ready for his grand appearance, I can tell you that… Which brings me onto our routine midwife appointment (there was also a student midwife there this time so we got second opinions on everything). Normal tests were done, urine sample – fine, blood pressure – fine, little mans heartbeat – fine. He’s also still head down, which is a good thing! After the pains I’ve been getting, I was hoping they were going to tell me he’s started engaging (otherwise I would have screamed!) – which he has! They both actually said out loud he was 4/5th engaged, but in my notes is written 4/5th p., which they obviously mean palpable! So he’s only really 1/5th engaged. It’s confusing enough as it is that they don’t use the same across the board, I’m glad I’ve read up on it beforehand! But, at least he’s started engaging! Just got to get him the rest of the way now. Tonight we’re going to a friends for dinner & cake – dinner is a curry! And then tomorrow I’m going to get on my ball to get him moving, bounce, bounce, bounce! And may even add a walk into the equation too… May also buy some pineapple! The hospital bags are all packed now and waiting in the living room, so we’re all ready. I must say, everybody is right, these last weeks do go really rather slow… I think we just want him here now, can’t wait to meet our beautiful little precious boy.